This reading list is adapted from a course about al Qaeda and international terrorism that I teach at the School of Advanced International Studies at the Johns Hopkins University. Peter Bergen, Holy War, Inc. Inside the Secret World of Osama bin Laden (New York: Touchstone, 2002). (Paperback edition). 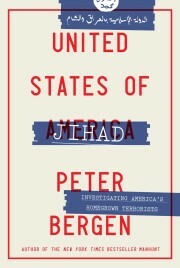 Jason Burke, Al-Qaeda: Casting a Shadow of Terror (New York: I.B. Tauris 2003). Rohan Gunaratna, Inside Al Qaeda, Global Network of Terror (New York, Columbia University Press 2002) (Paperback edition). Edited by Barry Rubin and Judith Colp Rubin, Anti-American Terrorism and the Middle East: A Documentary Reader (New York, 2002 Oxford University Press) [This is a useful collection of primary documents]. Another important resource is: http://www.albab.com/arab/background/laden.htm. This site contains a large number of bin Laden?s statements and interviews and other resources and is useful for several classes. www.siteinsitute.org and www.terrorism.com and www.intelcenter.com are also useful sites. An overview of Islamist terrorism and its intellectual influences, and a discussion of the underlying causes of the 9/11 attacks. Class 2 :The Afghan war against the Soviet Union, the role of the United States, and the formation of an Islamist internationale, 1979-1989. This class will examine the changing nature of al Qaeda from its inception in Afghanistan, and its sojourn in Sudan from 91-96. The most important testimony for this class is from the following days: Testimony of L’Hossaine Kherchtou, February 21, 26; Testimony of Essam al-Ridi, February 14, 2001; Testimony of Jamal al-Fadl, February 6, 2001. Afghanistan under the Taliban, the rise of the religious warriors and their al Qaeda allies. This class will examine the exact nature of the relationship between the Taliban and al Qaeda. Ahmed Rashid, Taliban: Militant Islam, Oil and Fundamentalism in CentralAsia (New Haven: Yale University Press, 2001) (paperback edition) pages 1-140 and appendices 1 to 3. This is the best account of the plan to assassinate Ahmad Shah Massoud, which was a prelude to the 9/11 attacks. This class will examine how al Qaeda became increasingly violent once it rebased itself in Afghanistan in ’96, with a particular focus on the US embassy bombing attacks in Africa, and the USS Cole attack in Yemen. We will also consider al Qaeda’s researches into weapons of mass destruction. Bernard Lewis, “License to Kill”? Foreign Affairs, November/December 1998. Anonymous, Through Our Enemies’ Eyes. Osama bin Laden, Radical Islam and the Future of America. (Washington, DC: Brasseys, 2002) [Anonymous is a serving CIA officer.] ch.11 pp 151-168 and ch. 12 pp. 169-194 and ch.13 pp. 195-224. The court transcript of USA v. Usama bin Laden (the embassy bombings trial) provides a wealth of material. The entire transcript of the trial is available at http://cryptome2.org/usa-v-ubl-dt.htm. The most useful days for this class are Testimony of FBI Agent John Anticev, February 27, 2001; Summation of Ken Karas, May 1, 2001; Testimony of Jerrold M. Post, M.D., June 27, 2001. Wolf Blitzer, Nic Robertson, Mike Boettcher, David Grange, Peter Bergen, Terror on Tape: Inside al Qaeda, CNN, August 25, 2002. This class will address the biographies and ideas of the most important figures in al Qaeda: Osama bin Laden and Ayman al-Zawahiri.